In a world that tells us to do it all and do it now, it can be hard to listen to the voice that says: "Stop. Be still, for a moment. Take care of yourself. It's OK."
Don't get me wrong, I am a huge believer in pushing the limits and giving 150% -- and sometimes we really do sell ourselves short when we could have tried harder, or gone further. Yet I think society too often casts limits as adversaries, where the goal is to "conquer" all our limitations and not let them "restrain" us. But what this kind of language does is, essentially, to set up an epic battle of us vs. our limitations. And if we don't win, it's our fault. What if, instead, our limits were our friends? What if they can be instructive helpers, our guides on this road through life? I'm starting to believe that they are -- or at least can be. Instead of mindlessly spinning a million plates because they're all so beautiful and important and I'm afraid to admit I can't hold them all up, maybe I could listen to my aching muscles, my nervous energy, my frantic heart... and say enough. I can't do everything, but I can do some things, and do them well. Limits can make us creative, build our resilience, and teach us about being human. When we heed the wisdom of our limits, maybe we do less but are free to give/be more. This post was made for Besotted's InspirationRx prompt on slowing down and listening to things we don't normally hear. 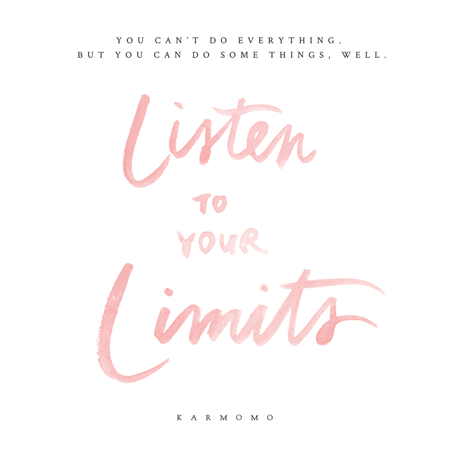 Do you listen to your limits? How do you manage that fine balance between pushing the envelope and respecting your limitations?